1. Heat the butter in a large pan and add the onion and garlic. Cook over a low heat for 3-5 minutes until soft but not browned. Add the chorizo and cook for a couple of minutes then add the potatoes and stir to coat in the juices for a minute or 2. 2. Pour in the stock and bring to the boil. Cover and simmer for 12-15 minutes until the potatoes are just cooked through. Stir in the milk and sweetcorn and bring to the boil. 3. Meanwhile, prepare the mussels. Rinse in cold water, discard any that are cracked or don’t close when tapped and remove the ‘beards’ (or see cook’s tip). 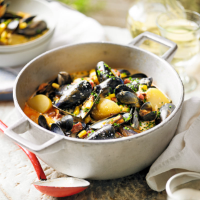 Add to the pan, cover and simmer for 4-5 minutes, shaking the pan until the mussels open. Discard any that stay closed. Stir in the chives and season to taste. Serve with crusty bread.